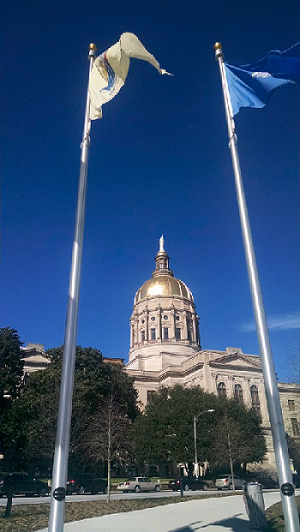 (APN) ATLANTA — The Georgia General Assembly wrapped up the 2016 legislative session on the early morning hours of Friday, March 25, 2016. This article provides an overview of the outcome of numerous bills that Atlanta Progressive News covered throughout the Session, that passed. These include: HB 859 Campus Carry; HB 941 New Rules for Grand Jury; HB 773 Increase Bond Limit for Georgia Housing and Finance Authority; SB 208 Proposed City of Stonecrest; HB 514 Proposed City of South Fulton; and SB 308 Funding for Pregnancy Crisis Centers. Funding legislation for MARTA passed, although in substitute form. The original MARTA proposal was for a one penny sales tax for Fulton, DeKalb, and Clayton Counties to fund several projects, including a MARTA North Line extension, new east line along I-20, and Clifton Corridor. The approved substitute would allow the City of Atlanta to do a one-half penny sales tax referendum for Atlanta transit projects, based on a list to be decided by the City of Atlanta; and would allow the rest of Fulton County to do a one-half penny sales tax, mainly for roads. In addition, a religious freedom bill passed, but was vetoed by Gov. Deal. HB 859, Campus Carry, sponsored by State Rep. Rick Jasperse (R-Jasper), passed the House on February 22, 2016, by a vote of 113 to 59. In passed the Senate on March 11, 2016 by a vote of 37 to seventeen. HB 859 allows for anyone aged 21 years or older, with a weapon license, to carry a concealed gun in a classroom, cafeteria, or library of any public technical school, vocational school, college, or university in Georgia. Exemptions are for dormitories, fraternities, sorority houses, and athletic events. It was a controversial bill opposed by Chancellor Henry Huckaby, Board of Regents, University System of Georgia; many university professors, parents, and students; Moms Demand Action; Gunsense Georgia; and others. HB 941 would change Georgia’s grand jury process that currently allows a police officer involved in a deadly force incident to stay in the grand jury room and listen to all the evidence, and at the end make an unchallenged statement, without being cross-examined or questioned by jurors or the prosecuting attorney. The bill is sponsored by State Rep. Rich Golich (R-Smyrna) in the House. State Sen. Charlie Bethel (R-Dalton) sponsored a companion in the Senate. It passed the House on February 23, 2016, by a vote of 161 to zero, and the Senate on March 22, 2016, by a vote of 51 to zero. The bill aims to curtail some of the special privileges given to police officers. However, some attorneys and libertarians say it also proposes many double standards for grand juries investigating law enforcement officers and sets up a two-tiered system of justice that empowers prosecutors to control grand juries and allows police officers to operate above the law. APN asked the local Georgia NAACP for their position and they supported the legislation. Among several housing bills covered by Atlanta Progressive News, HB 773 passed. HB 773 increases the bond limit for the Georgia Housing and Finance Authority (GHFA) for its single family residential housing program from 1.3 billion dollars to three billion dollars. It is sponsored by State Rep. Penny Houston (R-Nashville) in the House. State Sen. Charlie Bethel (R-Dalton) sponsored a companion in the Senate. HB 733 passed the House on February 24, 2016 with a vote of 160 to five, and passed the Senate on March 22, 2016, with a vote of 44 to nine. SB 308, sponsored by State Sen. Renee Unterman (R–Buford), to provide funds to crisis pregnancy centers, passed out of the Senate, by a vote of 38 to sixteen, on February 11, 2016. On March 11, the House passed a substitute by a 103 to 52 vote. On March 24, the Senate agreed to the the House substitute by a vote of 31 to sixteen. The bill will provide two million dollars for pregnancy crisis centers. APN explored issues involving this funding in an earlier article.